This portal is for the academic discipline of computer science. For other related portals such as computer networking, computer security and information technology, please see portals: technology and applied sciences. Computer science is the study of the theoretical foundations of information and computation and their implementation and application in computer systems. 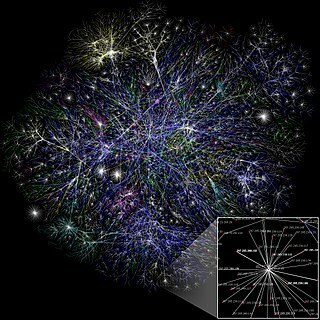 Computing science encompasses many branches; some emphasize the computation of specific results (such as computer graphics), while others (such as computational complexity theory) relate to properties of computational problems. Still others focus on the challenges in implementing computations. For example, programming language theory studies approaches to describing a computation, while computer programming applies specific programming languages to craft a solution to some concrete computational problems. Partial map of the Internet based on the January 15, 2005 data found on opte.org . Each line is drawn between two nodes, representing two IP addresses. The length of each line is indicative of the delay between those two nodes. This graph represents less than 30% of the Class C networks reachable by the data collection program in early 2005. Lines are color-coded according to their corresponding RFC 1918. Vinton Gray "Vint" Cerf (/ˈsɜrf/; born June 23, 1943) is an American computer scientist, who is recognized as one of "the fathers of the Internet", sharing this title with American computer scientist Bob Kahn. His contributions have been acknowledged and lauded, repeatedly, with honorary degrees and awards that include the National Medal of Technology, the Turing Award, the Presidential Medal of Freedom, and membership in the National Academy of Engineering. In the early days, Cerf was a program manager for the United States Department of Defense Advanced Research Projects Agency (DARPA) funding various groups to develop TCP/IP technology. When the Internet began to transition to a commercial opportunity during the late 1980s, Cerf moved to MCI where he was instrumental in the development of the first commercial email system (MCI Mail) connected to the Internet. Cerf was instrumental in the funding and formation of ICANN from the start. He waited in the wings for a year before he stepped forward to join the ICANN Board, eventually becoming chairman. Cerf went to Van Nuys High School along with Jon Postel and Steve Crocker; he wrote the former's obituary. Both were also instrumental in the creation of the Internet. Cerf is also known for his sartorial style, typically appearing in three-piece suit—a rarity in an industry known for its casual dress norms. ^ "Math 169 Notes - Santa Clara University". ^ Eugene Loh (June 18, 2010). "The Ideal HPC Programming Language". Queue. Association of Computing Machines. 8 (6).